Aperitifs: because it’s good to drink before dinner. They’re great for bars too – no need for happy hour at places such as Artesian or Connaught when punters are politely climbing over themselves to get their paws on pre-dinner cocktails. Dry Martini kicks off an evening with purpose while the Negroni is a tamer affair. Wthout the gin it is an Americano which goes further into the realms of responsible pre-dinner drinking. How the Manhattan and Old Fashioned make it into both aperitifs and digestifs we don’t know, but can only say don’t blame the messenger. We suppose these classic cocktails are popular right now whatever time of day. Probably if we’d done a brunch cocktails list, you’d find the Old Fashioned and Manhattan there too. 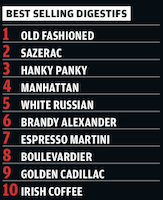 Naturally it is the two most famous American whiskey cocktails that lead the digestif list – the Old Fashioned and Manhattan are rich nightcaps that work perfectly after the exertions of a meal. Next up we find our old friend the Sazerac. After an evening of food and fun what better way to finish off than with the strongest drink of the night? Some say the Sazerac doesn’t take prisoners. It does, but it tortures and kills them. It’s a big cocktail that requires the sub-conscious contemplation of a night’s sleep. It’s nice to see the Espresso Martini and Irish Coffee make appearances too. These are good old two-for-one type drinks. Why buy a coffee and a spirit when you can combine the two? When is a Highball a cocktail and cocktail a Highball? It’s up there with life’s great imponderables. All we know is, the G&T is not a cocktail – providing it’s not a very creative one with fancy extra ingredients. Most we have seen at The World’s 50 Best Bars are classic gin, tonic, ice and wedge of citrus affairs. 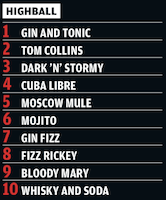 Tom Collins beating the Cuba Libre is heartening for apostles of quality drinking. 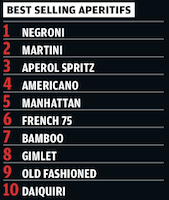 There are clearly more lemons than cola at The World’s 50 Best Bars – that or customers can’t quite bring themselves to order a glorified rum ’n’ cola in a cocktail bar. In third and fifth we have Dark ’n’ Stormy and Moscow Mule, reflecting a trend towards house-made ginger beer. The fizzes Gin Fizz and Rickey are refreshing drinks for the uncomplicated occasion.